Bhubaneswar: An elderly couple from Nalanda in Bihar, NCC official Colonel Chandan Jha from Berhampur with family, Ishwari Bhalerao, a student of Slade School of Art, London and four Odissi dancers from the city were among the prominent walkers at the 25th Monks, Caves, and Kings (MC&K) heritage walk at Udayagiri and Khandagiri, today. Maheswar Prasad (68) a retired teacher from the historically significant place in Buddhism, Nalanda, joined the walk with wife Mala Devi (63) and his kids. 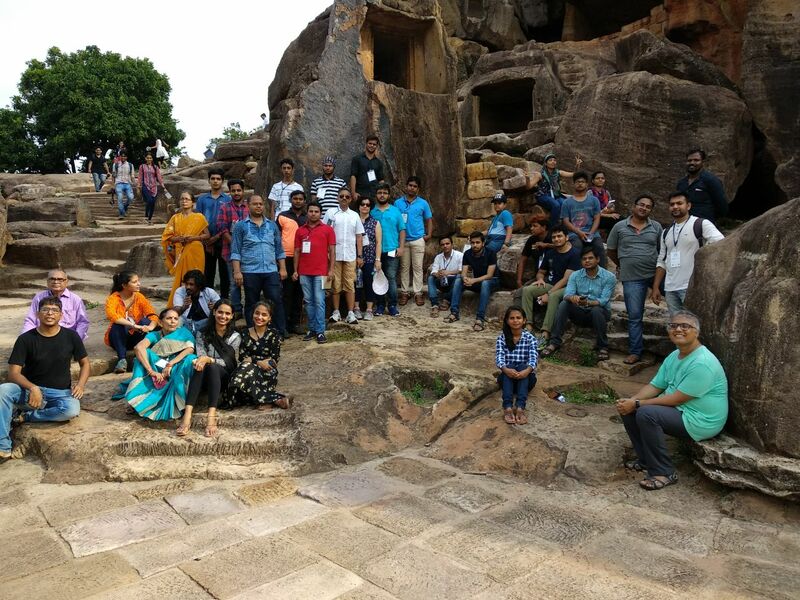 “I had been to Bhubaneswar five to six times before this, but never I listened to such interesting stories on the caves, rulers and the monks, who stayed there and worked towards the development of Jainism,’’ Prasad observed. Prasad’s kids are studying in Bhubaneswar while he stays in Nalanda. It can be noted here that while Buddhism proliferated after the great Kalinga war, which was fought near the Daya river valley on the outskirts of Bhubaneswar, Nalanda was famous for its university at the olden times where scholars were learning the teaching of Buddha. Later, it was also found that many places in Odisha near Ratnagiri and Lalitgiri were also associated with similar campuses like Nalanda for the teachings of Buddhism. Pune-born Ishwari Bhalerao, who is doing her undergraduate course in arts from Slade School of Fine Art, London, said “the city Bhubaneswar has an interesting collage of Hindu, Buddhist and Jain heritage sites, making it a city of many faiths and with a wonderful treasure of stone-based works and the unique Kalingan temple architecture.’’ Ishwari is currently doing a residency course at Utsha Foundation. Dibyadarshini Supakar, Kashish Bharati and Priyadarshini Mohapatra all Odissi dancers learning the dance form in the city, also added that the heritage walk provide an interesting platform for all types of travellers to know about the ancient tradition and culture of the state. City-based archaeologist Jitu Mishra of Viraasat-E-Hind Foundation led the 52-membered strong visitors group at the Twin Hills and explained the various facts and stories to the participants.